We will hold a provisional booking for 10 days without obligation. If no deposit is received then the booking with automatically released. We will reserve the "prime" times of 11.30am, 1.00pm, 2.30pm and 4.00pm for parties who both stay and dine with us. The other times of 10.00am, 5.30pm and 7.00pm are available for ceremony only bookings. Should an accommodation and meal booking be cancelled we reserve the right to move the cremony to a non-prime time. 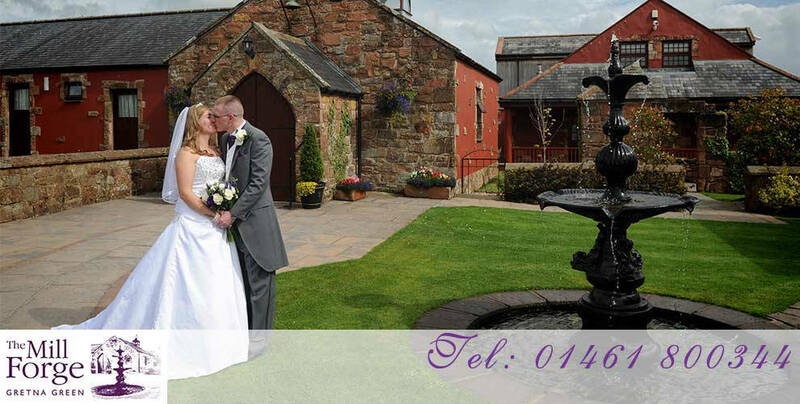 WEDDING PACKAGES - The appropriate deposit for your package must be made when submitting your booking form. The balance of the package is due 3 months before your wedding. NB. We will not accept one without the other. Any accommodation discount in our packages only applies to accommodation booked direct with The Mill. ACCOMMODATION - A deposit of £20 per room per night is required to confirm a reservation. RECEPTIONS - A deposit of £5 per person (including children) is requierd to confirm a meal booking. PACKAGES - Please see the individual packages for the required deposits. Wedding Packages - All packages including ceremony only bookings will be refunded according to the timescale below. Deposits on accommodation will only be refunded within 7 days of the deposit being received. After 7 days a £20 administration fee per room per night will be implemented. If a wedding is changed to a later date or time then all monies paid will be allowed against that revised date. The Mill will allow a wedding to be changed once only and a new date is required within 2 weeks. A wedding date / time cannot be moved less that 12 weeks before the ceremony date. N.B. Changes of date / time will be subject to an adminstration fee equal to 10% of the package price. In such event, The Mill will refund any advance payment including deposits but will have no further liability. Where applicable the balance of your package is to be paid no less than three months before the date of your wedding. Additional meals / drinks package upgrades / evening buffets must be paid no less than three weeks before the event. WEDDING RECEPTION - Full payment is required no later than 21 days prior to the event. After this time, the numbers you have given us will be accepted as final and no refunds will be made in the event of cancellation. An increase in numbers will only be allowed at the discretion of The Mill and will be charged for on the day. ACCOMMODATION - The balance of payment is due upon check-in but can be paid in advance if desired. We accept all major credit cards except American Express. Cheques should be made payable to "The Mill". Please note we cannot accpet cheques exceeding the guarantee card limit less than 14 days before the event. Our prices are correct at the time of going to print and where appllicabel include VAT at 20%. The prices quoted for other services are subject to change. Check-in is 2.00pm on the day of arrival and check-out is 10.00am on the day of departure. A changing room is available but must be prebooked. It costs £10 per hour with a minimum hire of 2 hours. Responsibility for payment lies with the person who has booked the accommodation whether an individual or a group booking. Function rooms are allocate by The Mill and we reserve the right to change function room allocation in the event of party numbers changing significantly. A house disco is provided at our discretion and is for the enjoyment of all guests of the hotel and not private to any individual party. We reserve the right to cancel a disco if the numbers do not reach the amount originally booked. You will be liable for the cost of repairs carried out as a result of damages caused to any part of the hotel premises or equipment therein by negligence, wilful act or default of any person invited by you or on your behalf to the hotel. The Mill is totally non-smoking and will not permit smoking in any of its premises.